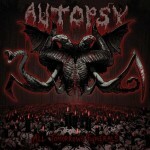 Review: "Autopsy: All Tomorrow's Funerals" - Sea of Tranquility - The Web Destination for Progressive Music! All Tomorrow's Funerals is the latest release from death metal legends Autopsy, and upon closer review it's actually a bunch of new tunes beefed up with songs from their previous EPs and assorted rarities, all remastered. 22 tracks in all, and nearly 74 minutes of gory goodness. Considering this San Francisco band has now been around since 1987, they've surprisingly not lost a step over the years. Led as always by drummer/vocalist Chris Reifert, the band once again pulverize the listener with their old school death metal approach that's neither flashy nor refined, just simply pummeling in its execution. Reifert's guttural growls & grunts slice through the mix of crushing riffage and pounding rhythms on such grueling tracks as "Broken People", "Mauled to Death", "The Tomb Within" and the hauntingly lethal title track. For pure unadulterated death metal savagery, you can't go wrong with a track like "Seven Skulls", a genre anthem if ever there was one, and "Horrific Obsession" has plenty of massive doom elements to go along with the death metal fury. Longtime fans of the band will no doubt eat this fat collection up, and if you've never taken the plunge into the world of Autopsy before, but love acts like Obituary, Slayer, Bolt Thrower, Vader, and Morbid Angel, then no doubt you'll find lots to love on All Tomorrow's Funerals.